They want a 4th film now? Get my agent on the phone! After years of producing films of evolving maturity and sophistication, it is legitimate to consider whether Pixar and its parent Disney– not immune to the sagging economy – are milking its first and most lucrative cash cow for an easy money grab by unveiling Toy Story 3 15 years after the original entry and 11 years after its sequel. Fearing the unknown but still yearning relevance, the gang escapes to an alluring daycare with a sinister underbelly. They are greeted by a virtual island of misfit toys, run by Lots-o’-Huggin’ (Ned Beatty), a huggable pink bear with a genteel Southern façade that masks a despotic plantation owner’s cruelty. Backed by Lotso’s hench-dolls – the spookiest baby this side of Chucky and a metrosexual Ken (Michael Keaton, having a blast) – our newcomers are banished to the Caterpillar Room, a hellhole director Lee Unkrich depicts with the frenzied madness of an early Sam Raimi horror flick or the riot scene in One Flew Over the Cuckoo’s Nest. From there, Toy Story 3 becomes, of all things, a taut prison-break flick, with Lotso playing the part of the warden from Cool Hand Luke. 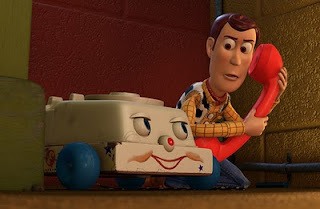 He brainwashes Buzz by flipping the Demo switch beneath his battery cover, which leaves it to Woody to help his mates escape using some Mission: Impossible style strategizing. The visuals (3-D version not necessary) are still gorgeous but now hued with a comforting retro quality. And, the series’ trademark humor is as snappy as ever, although the obvious, uneasy chuckles at the expense of Ken’s foppishness and Buzz’s amorous Spanish language mode are the sort of things Shrek sequels do – “Like your as-cot,” Barbie coos to Ken. But, only Pixar could craft a charming fable about facing one’s mortality, including a relatively macabre turn that sees our plastic protagonists linking hands in quiet acceptance of a seemingly inevitable fiery demise. While trying to find his way back to Andy, Woody is innocently nabbed by a toddler named Bonnie, whose bedroom is filled with a troupe of stuffed animals led by a British hedgehog named Mr. Pricklepants (Timothy Dalton), who treats every imaginary tea party or outer space adventure like a West End production. As Woody joins in their playtime, a look of sheer, long-lost ecstasy creeps across his face, overjoyed to be working again…needed again…wanted again. The scene speaks to the plight of the jobless in our current economic climate. More broadly, however, it illustrates the universal urge to find happiness and meaning in our existence. The script by Little Miss Sunshine scribe Michael Arndt always couches these thematic complexities in terms of workmanlike fun until the poignant final five minutes, which packs an emotional punch rivaled only by Up’s opening act montage. Oozing with bittersweetness, the denouement’s lesson about both treasuring and letting go of the past elegantly concludes this seminal trilogy. Behind your smile will be a lump in your throat, as Toy Story 3 just might send you rummaging through the bygone boxes in your attic.